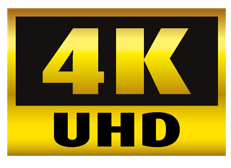 4K refers to the high definition resolution of 4096 x 2160 pixels, four times of 1080p which is the current standard for high definition resolution. With tech leaders such as Sony, Microsoft and Samsung now supporting 4K, it is clear that 4K video content is the next generation of HD viewing. While, 1080p High Definition format has not yet been covered wholly- the majority of playback, editing work is still being finished in 1080p. In most cases, we still need to downscale most of the Ultra HD 4K stuff to 1080p. If you've got some 4K Ultra HD videos, but have no ideal how to work with them, you are in the right place. This page will give you some tips and tricks how to play, edit 4K videos in a simple way. Play 4K Videos - Whether you are wanting to watch stunning 4K videos on your huge widescreen computer monitor, or on your smartphone, having a piece of software that is capable of playing this increasingly popular and widely used format of ultra high definition video smoothly will make all the difference in how much you enjoy the experience. But it's not only 4K videos that you'll probably want to be playing - regular HD videos can also prove problematic for many video players. Issues like stuttering and codec incompatibility are still widespread, which is why finding a highly reliable, competent video player program is of such high importance. Don't worry. Here you can quickly find the solution. Wanna to import 4K video files for editing or burning, but your video editor or DVD burner don't let you do it? Here we will provide useful tips to help you solve the problem. Although 4K videos are being distributed more than ever before as this technology becomes more widely and cheaply available to amateur videographers, many video player programs still do not support it. That's why you will need to downscale or convert 4K videos to 1080p video files. Here are the solutions for you.